Minichamps 1:8 diecast replica of Valentino Rossi's AGV Helmet from the 2018 Sepang Test. 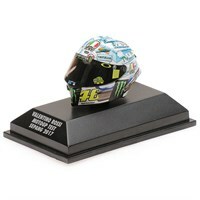 Minichamps 1:8 diecast replica of Valentino Rossi's AGV Helmet from the 2017 Mugello Moto GP. 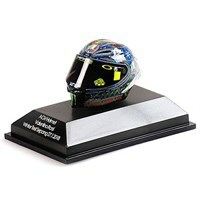 Minichamps 1:8 diecast replica of Valentino Rossi's 2017 AGV Helmet Angel Nieto/Nicky Hayden Tribute. Minichamps 1:8 diecast replica of Valentino Rossi's AGV helmet that he wore at the 2017 Moto GP.